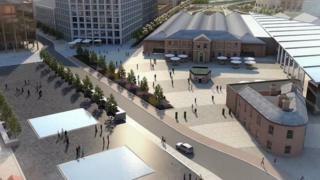 Multi-million pound plans to transform the area behind York railway station have been approved. The project will see up to 2,500 homes and 86,600 square metres of office space built on the brownfield site near the National Railway Museum. York Central Partnership said work should begin later this year, but could take 20 years to complete. At a council meeting on Monday, residents raised concerns about air pollution, traffic and other issues. The meeting lasted more than five hours and heard from 31 public speakers. York resident Richard Clark told the committee it had been impossible for residents to read all the application documents in time. He believed most of the housing would be unaffordable. Developers said 20% of the housing would be classed as affordable. Councillor John Galvin, 80, is a member of the planning committee at York City Council and said he would love to be around for when the £650m project is finished. "We have had 30 years to get to where we are now and it's going to take a minimum of 20 years to get this completed. "The sad fact is that I won't even be here when it's open - I would love to come down and see it when it's finished." The scheme, which covers 45 hectares, is one of the largest regeneration sites in England. York Central Partnership is made up of a partnership between Homes England, Network Rail, the City of York Council and the National Railway Museum. A spokesperson for the group said: "This is a huge moment for a project. "York Central represents the biggest opportunity to transform York in generations, and the council's decision... marks a huge step forward in bringing much needed homes and jobs into the city." The application will now be considered by the government before a detailed planning application, with designs for the homes and offices, is submitted to the council.